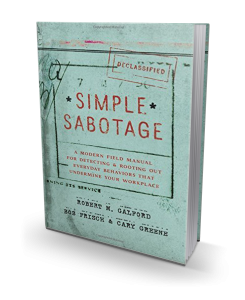 Inspired by the Simple Sabotage Field Manual released by the Office of Strategic Services in 1944 to train European resistors, this is the essential handbook to help stamp out unintentional sabotage in any working group, from major corporations to volunteer PTA committees. Insist on doing everything through channels. Make speeches. Talk as frequently as possible and at great length. Refer all matters to committees. Bring up irrelevant issues as frequently as possible. Haggle over precise wordings of communications. Refer back to matters already decided upon and attempt to question the advisability of that decision. Advocate caution and urge fellow-conferees to avoid haste that might result in embarrassments or difficulties later on. Be worried about the propriety of any decision. Everyone has been faced with someone who has used these tactics, even when they have meant well. Filled with proven strategies and techniques, this brief, clever book outlines the counter-sabotage measures to detect and reduce the impact of these eight classic sabotage tactics to improve productivity, spur creativity and engender better collegial relationships. Robert M. Galford is the managing partner of the Center for Leading Organizations and teaches on executive education programs. 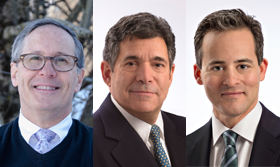 He is the coauthor of The Trusted Advisor, The Trusted Leader, and Your Leadership Legacy. He lives in Concord, Massachusetts. Bob Frisch is the managing partner of the Strategic Offsites Group and is considered among the world’s leading strategic facilitators. He is the author of Who’s In the Room? and frequently contributes to Bloomberg Businessweek and The Wall Street Journal. He lives in Boston, Massachusetts. Cary Greene is partner at Strategic Offsites Group and leads their efforts on large-scale transformation and strategy programs. Greene is the coauthor of Critical Conversations that Reset How Your Organization Manages Initiatives published by Harvard Business Publishing. He lives in Boston, Massachusetts.